Ever wondered why Irish Pubs are so very popular outside Ireland? It’s a lot to do with our history and heritage – a fact that Ol Irish Pubs, the pub design company, use inherently in their design concepts around the world. The global expansion of the Irish pub happened as the first emigrants left our shores on boats to make better lives for themselves and their families. As we Irish emigrated, we brought with us our traditions, beliefs and our community hub: the Irish pub. So when Ol Irish Pubs design and create an Irish Pub today, we stay true to what has worked in the past. With all our pub designs and concepts, we put the client’s needs to the fore. We use a well-established 5 stage work process, from inception to completion, to deliver the desired result for the client. We consult with the client at every phase of the project to ensure that the final result exceeds expectations. Ol Irish Pubs will visit the client site and carry out an inspection to assess the space and what we have to work with. This helps gain a full understanding of client needs, expectations, budgets and timelines. We can then start to flesh out what’s feasible: space planning, budget analysis, design concepts, finish specifications, furniture specifications and accessories. We forward a detailed proposal to the client, which includes plans, drawings, proposed space usage, elevations, mood boards, key dates, budget and contract listing. The contract listing includes every element of the pub interior and exterior. This ensures that the client understands all parts of the plan, time lines and bar build process. 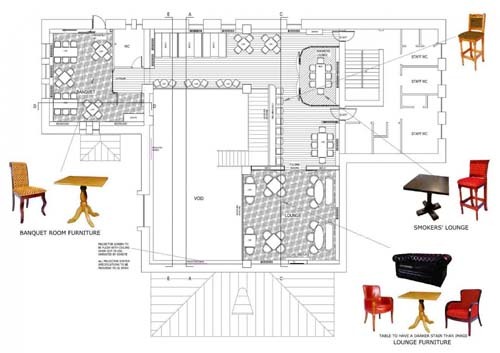 We always have the client involved to advise on the working of the space. This can evolve as plans develop and, as a pub design company, we will happily alter the design until all parties are satisfied. The design details consist of: handcrafted Irish joinery (woodwork), bric-a-brac, external treatment, feature work, floor finishes, custom made, handcrafted Irish furniture, glass-work, ironmonger, light fixtures, metalwork, custom made signage, walls and ceiling finishes. We will identify the specific materials to be used (fabrics, surfaces, accessories and more) and finalise all specifications of agreed plan. Once the finalised design and plans are approved, manufacture of the pub commences. The pub materials are all sourced and hand made in our workshops in Ireland. Throughout the production stage, we provide images of each element of the client’s bar as it is being made. This ensures that the client’s expectations and requirements are being constantly maintained at all points. It also allows an opportunity to make alterations prior to shipping. Most of our clients actually come to Ireland to experience the production process first hand and examine the quality of the product. We transport the pub and ship everything in containers to its destination. We send over our own expert team of fitters, joiners, painters and tilers to install the pub and complete the bar build to the expected high standards. As an Irish pub design company, we have worked in all parts of the world – experience that stands us in good stead to tackle projects in any location. Our step by step process lets us complete pub designs of all shapes and sizes in a timely and cost effective manner, while allowing us to innovate great design concepts to satisfy the most demanding of clients.